These, our most popular course are designed for beginners to take you through all the basics of the sport. At ShoreSports we use the most up to date wide-style boards and lightweight sails. Our instructors are trained to RYA instructor standards and have years of teaching experience. The Complete Beginner Windsurfing Course can be taken either over two days or in one. Within this two part windsurfing course we will cover: how to get going efficiently, tacking, gybing, sailing upwind and downwind. We also cover basic theory and safety advice. The Start Windsurfing Course is a two day comprehensive course designed for people wanting to try or take up windsurfing. As RYA qualified instructors we cover the complete syllabus, going through the basics of getting up and going, sailing up and down wind, theory and rigging. We supply all the equipment needed including wetsuits, buoyancy aids, etc. All you need to bring is trunks and a towel. To purchase a voucher for any of our courses simply click on the Buy Now button or email us with your details and the voucher you require. 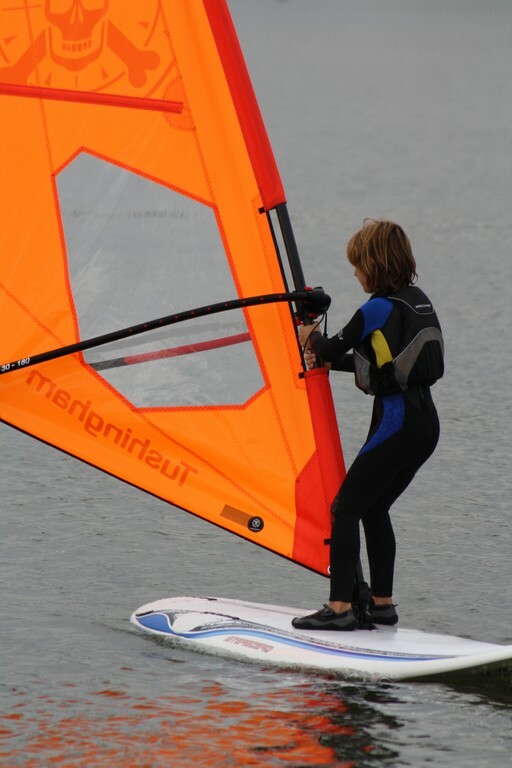 ShoreSports uses the sheltered waters of Christchurch harbour for all it’s windsurfing lessons and hire. And are CRB checked, fully licensed and hold an Adventure Activities Licensing Authority Certificate.